The author of this letter has not yet been identified though it seems pretty certain he was a member of Company K in the 12th Wisconsin Infantry — sometimes referred to as “the marching 12th.” The 12th Wisconsin saw very little fighting during the Civil War but saw hard times on the march. The 12th was organized at Camp Randall in October 1861. They spent the winter of 1861-2 traversing back and forth across the foothills of eastern Kansas in severely cold weather. In May 1862, they boarded transports and went down the Missouri River to St. Louis, and from there to Columbus, Kentucky, which they reached on the 2d of June 1862. They were put to work repairing the Mobile & Ohio Railroad and then sent to Humboldt early in July. There, a part of the regiment was mounted and employed in scouting the adjacent country, and fighting guerrillas until October when it moved to Bolivar and was attached to the 17th Army corps. After the battle off Corinth, the 12th Wisconsin marched in pursuit of the rebels — making thirty miles in ten hours — and arriving at the Hatchee just too late to participate in the battle. Late in 1862, it joined in the movement of Grant’s army south into Mississippi but were frustrated by the surrender of Holly Springs which cut off their supply line and forced their retreat into Tennessee. In February 1863, they were employed as guards on the Memphis & Charleston Railroad. On 14 March 1863, they were sent to Memphis. Later in the war, they participated in the Siege of Vicksburg and then helped Sherman’s army force the evacuation of Jackson, Mississippi. From the fall of 1862 to the fall of 1864, the regiment is estimated to have marched almost two thousand miles, most of it on foot. The content of this letter suggests that he was from Grant County, Wisconsin — possibly from Boscobel or Fennimore Township. The letter is incomplete so there is no signature. There also is no envelope to provide clues on the identity of the recipient who is addressed as his “sister.” Another correspondent named “Albina” is mentioned but it is unclear if she is another sister, a more distant relative, or simply an acquaintance from Grant County. I could only find two females named Albina in Grant County prior to the war. One was Julia Albina Allen, the daughter of Ira and Lois (Bearce) Allen, who married Thomas Burden in 1855. But Albina’s only brother, Addison Dexter Allen (1825-1863), served with the 33rd Wisconsin (as did Albina’s husband). The other was Albina Rosalia Trowbridge (1858-1938) who seems to have been raised in the same household with a number of children named Wood and there was an Ed Wood in Co. K, 12th Wisconsin. But this Albina seems too young to have been a correspondent. I received another letter from you this morning. You say that Albina wrote to me a few days previous to the date of your letter but I have not received that one yet. Albina may feel slighted at my writing to you more than to her. But you can consider that ’tis to both of you & both of you can read it. I am very thankful for the stamps and they will come very handy although I intended to get along without calling for help. We started from Waterford yesterday about three o’clock in the afternoon and marched up within a mile of town in the rain. This morning we moved to the north side of town where we will put in this night in the mud. We expect to march north tomorrow toward La Grange, Tennessee. There is some talk that we are going to Memphis. I don’t know what for. I think the war is running rather (I say rather) very slow. Gen. Burnside has been cut to pieces [at Fredericksburg]. In fact, we seem to meet with defeat everywhere. Some of our boys hear every mail of the death of some of their friends or relations in the Army of the Potomac. One of my tent mates this morning received intelligence of his brother having his leg cut off. The brother was in Capt. [Mark] Finnicum’s Company [Co. H], 7th Regiment Wisconsin Volunteers. ¹ Most all of my acquaintances in the 20th [Wisconsin] Regiment ² are gone where (in my opinion) two-thirds of us will go ‘ere this war ceases. The 33rd [Wisconsin] is camped close by us tonight. ³ I have not seen Vello for over a week. I saw Sampson today. Tell Mother to feel as easy as possible concerning me and mine. I got the mittens all right though I have not needed them but very little yet, nor do I think I shall need them. I have got but one pair of socks and no immediate chance to draw any more, nor are they of but little account after they are drawn. If ’tis convenient, some of you may send me a pair of stockings. No pay yet but for my part I shall not fret about that. I borrowed five dollars of a friend about two months ago and have just got ten cents of it left. I guess I shall have to keep that to cure sore eyes. A piece of silver or a white woman are the greatest curiosities of the day down here. The town is pretty well lighted up tonight with secesh houses burning. † The officers can hardly keep the boys in subjection; they are so eager to burn rebel property. I think if I should get home sometime I can like milk. I gave my promise of a a quarter to one of the [boys] that had been out in the country for a canteen of milk. This hard fare you may think goes rough. You are mistaken. I am perfectly reconciled to my fate and as happy as a clam (as the saying is). Bed time. I will finish this concern in the morning. Yet one more line. No, I can’t think of one line without writing two or three. I feel considerably like writing but the taps have beat and the lights must be blown out. Good bye until another time. Saturday Morning. January 10, 1863. 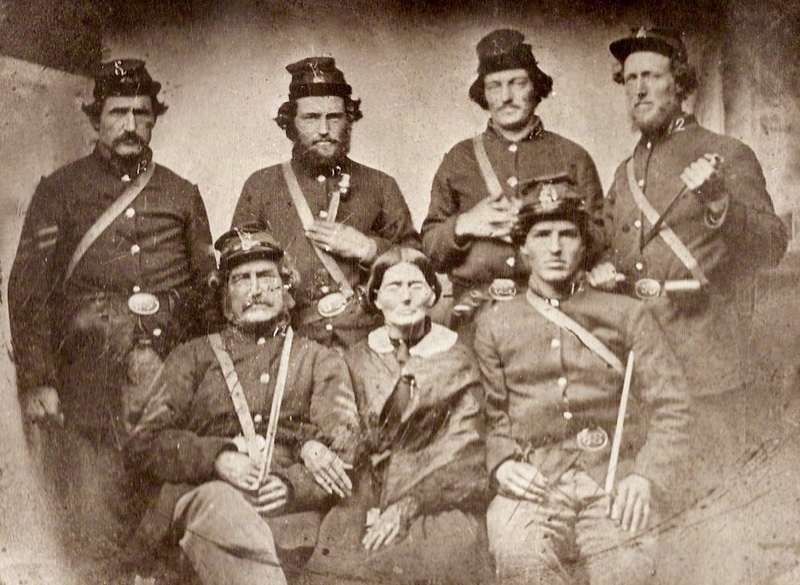 Lewis Wayne (lower left) with wife & four sons (standing) and another relative John T. Farrel. All soldiers served in Co. K, 12th Wisconsin Infantry. If it had not been for the war, this city of Holly Springs, Mississippi, would have been a nice little place — not so little. Such destruction you cannot imagine. The 20th of December when the Rebs came in here a great many of windows were fired through by women at our men. Such houses as far as found out are burned immediately. ¹ Mark Finnicum (1823-1912) was born in Ohio and was a merchant in Fennimore, Wisconsin at the start of the war. On July 20, 1861 he became captain of Company H, 7th Wisconsin Infantry. He was elected to major in early 1863. At Gettysburg he took over command of the 7th when its colonel, William W. Robinson, took over command of the Iron Brigade. Finnicum was promoted to lieutenant colonel in January of 1864. He was wounded at Spotsylvania but returned to duty on May 31. He resigned his commission on December 17, 1864. He died November 4, 1912 in Pulaski County, Kentucky. 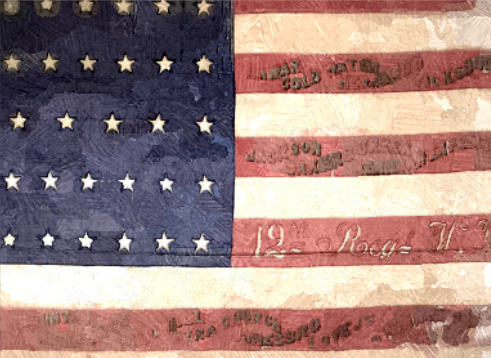 ² The 20th Wisconsin Infantry was engaged in the Battle of Prairie Grove in northwest Arkansas on 7 December 1862 where they lost 209 men in killed, wounded or missing. ³ The Diary of William S. Parr of Co. A, 33rd Wisconsin Infantry tells us that the 33rd was encamped near Waterford, Mississippi in late December 1862. The regiment broke camp and marched to a new camp both of Holly Springs on 5 January 1863. The regiment remained there until the evening of 10 January 1863 when they marched to within a mile or two of Moscow, Tennessee. 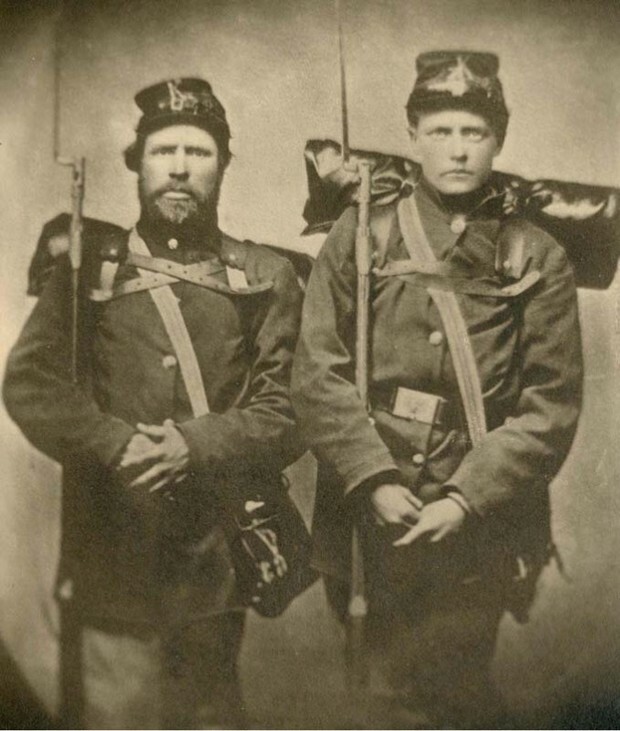 Left: George Tuffley and his son, Thomas H. Tuffley, residents of Boscobel, Wisconsin who served in Company K, 12th Wisconsin Infantry Regiment during the Civil War. The image depicts both men standing in uniform holding their muskets, while wearing forage caps and knapsacks with blankets. Originally from England, the Tuffley family immigrated to Wisconsin sometime around 1850. They settled in Boscobel where George worked as a gunsmith and a farmer. Thomas enlisted with Company K, Wisconsin Infantry Regiment in September 1861, with George enlisting in the company a month later. George mustered out of service at the end of his enlistment in 1864. Thomas reenlisted and mustered out with rest of the company in 1865. After the war, both men returned to Grant County, where they both lived in Boscobel and worked as farmers. This entry was posted on Wednesday, October 1st, 2014 at 1:47 pm	and posted in Uncategorized. You can follow any responses to this entry through the RSS 2.0 feed. My great-great grandfather was Addison Dexter Allen you mentioned above. He died in February 1863 of illness in Tennessee. It was great to read this article.